Republic of Ireland captain Roy Keane has been sent home from Japan after falling out with manager Mick McCarthy. Keane's blistering attack on the team's training facilities and programme in the build-up to the tournament sparked the row. And the stand-off finally exploded during a stormy meeting between Keane, McCarthy and other players. Steve Staunton will now take over as captain of the Ireland side for the World Cup. And Keane has probably played his last international match as he had earlier revealed his intention to concentrate on club duties following the World Cup. Was McCarthy right to send Keane home? McCarthy and the Football Association of Ireland will seek special permission from Fifa to bring in Colin Healy to replace Keane. But it is unlikely that will be granted, now the official deadline for squads to be named has passed. The news ends a three-day saga, in which Keane threatened to quit but was then persuaded to change his mind. His outspoken comments regarding Ireland's preparations and the training facilities in Saipan brought the confrontation to a head. And McCarthy confirmed a heated exchange on Thursday was the final straw. "I cannot and will not tolerate that level of abuse being thrown at me so I sent him home," McCarthy told the BBC. "I have made the right decision, not only for the benefit of me but for the squad. "This is a huge decision but I am happy to go to the World Cup one man down rather than with a man who shows utter disregard and disrespect for me." Earlier, Keane declared that the presence of "one or two people" he has difficulty working with was a key factor behind his decision to retire from international football. "My sanity is more important," said Keane. "I came over here to do well and I want people around me to want to do well. "If I feel we're not all wanting the same things, there's no point. It's been going on a while. "I'm banging my head against a brick wall regarding certain issues about this trip. From the training facilities to all sorts. "This trip is the tip of the iceberg." 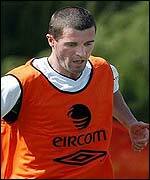 Has Keane played his last game for Ireland? In his scathing attack on Ireland's World Cup preparations, Keane singled out the 17-hour flight the squad endured to reach their base in Saipan and the training facilities they encountered on arrival. "Training pitch, travel arrangements, getting through the airport when we were leaving, it's the combination of things." "I'm not being a prima donna." "The episode has left a sour taste in the Irish camp"
"Roy didn't want to be there"